To apply for membership to these groups, please use this online form. This program is for clerks, treasurers, finance officers, and/or anyone who performs the duties of those offices. Certification requires registration into the program, payment of the registration fee, and attendance at one annual workshop approved by the MC&T Advisory Committee. The Advisory Committee has established the hours and training required for state certification. MCO was organized in 1991 as an organization of mayors and vice mayors from across Oklahoma who work together to promote the common goals of all Oklahoma municipalities. The Oklahoma Association of Municipal Attorneys (OAMA) was formed to educate, support and inform municipal attorneys in the highly specialized field of municipal law. The member cities and towns, through their attorneys, operate the organization. This Board was formed by the OML Board of Directors in April 2010 to further the League’s on-going efforts to increase municipal revenues. 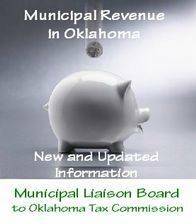 The purpose of the Liaison Board is to identify problems with the Oklahoma Tax Commission (OTC) involving sales and use tax collections and enforcement; the Independent Auditor Program as well as accountability by OTC for the retainage paid by municipalities for enforcement of their sales tax ordinances. OCEA Offers Understanding and Perspective to Code Issues. Founded in 1994, the Oklahoma Code Enforcement Association is dedicated to the study and advancement of Code Enforcement at the local, county and state levels. Its membership represents both large cities and small towns that have an interest in enhancing neighborhood and community health, safety, welfare and aesthetics. The Oklahoma Municipal Judges Association exists to help municipal judges with the exacting duties of municipal court management. OMJA is run entirely by its member judges. Collectively, we have the ability to provide each other with a wealth of experience and expertise. OMJA is dedicated to sharing that expertise for the benefit of municipal officials. Municipalities must speak clearly on legislative and public policy water issues. The Oklahoma Municipal Utility Providers (OMUP) was created as a legislative action group. OMUP will educate and update municipalities on the status of ongoing water issues, including funding, new regulations, NOV’s and consent orders and more. CMAO promotes efficiency of city managers, county managers and other urban administrators and aids the improvement of urban administration in general. The association also provides information on matters of interest or concern to all urban governments.